Alice's Adventures in Wonderland (1865) and Through the Looking Glass (1871) by Charles Lutwidge Dodgson illustrate the child-ego's attempt to mature and understand its own mortality in a world often found morally strange and ridiculous, a world that adults eventually learn to accept as normal. Alice’s Adventures in Wonderland (1865) and Through the Looking Glass (1871) by Charles Lutwidge Dodgson illustrate the child-ego’s attempt to mature and understand its own mortality in a world often found morally strange and ridiculous, a world that adults eventually learn to accept as normal. Alice is faced with the cruelties and strangeness found in Wonderland in the Red Queen and the Mad Hatter and Alice must learn to choose sides quickly in order to survive. ”’After such a fall as this, I shall think nothing of tumbling down-stairs! How brave they’ll all think me at home! (Which was very likely true. )’ (p 20). True, because she would be dead and unable to speak much of anything. ”Ah, cruel Three! In such an hour…Yet what can one poor voice avail / Against three tongues together… And ever, as the story drained / The wells of fancy dry…’Like pilgrim’s withered wreath of flowers / Plucked in a far-off land.’ And we are all headed that way, that far-off land one day, in the end; no one escapes Death. 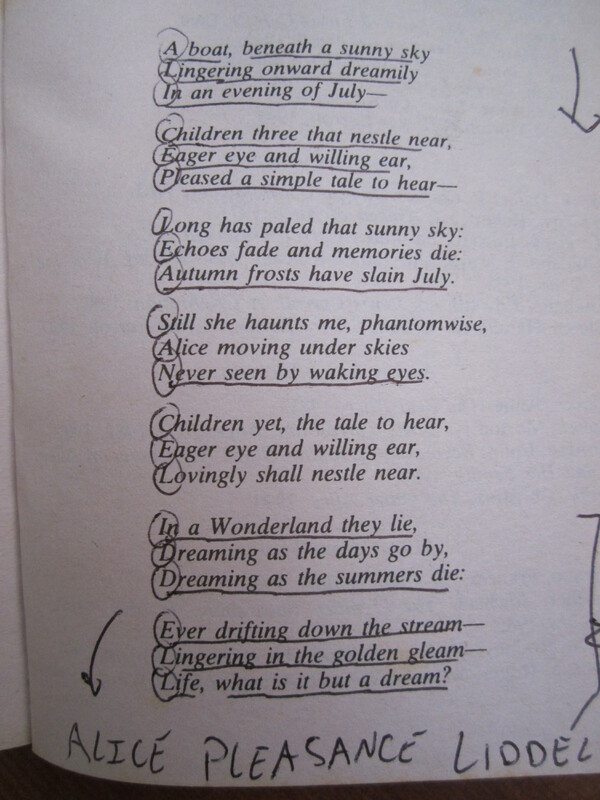 In the beginning, Alice is chasing Time itself, as all children do as Time is quite an illusive concept, just as the Rabbit is, to the child Alice. 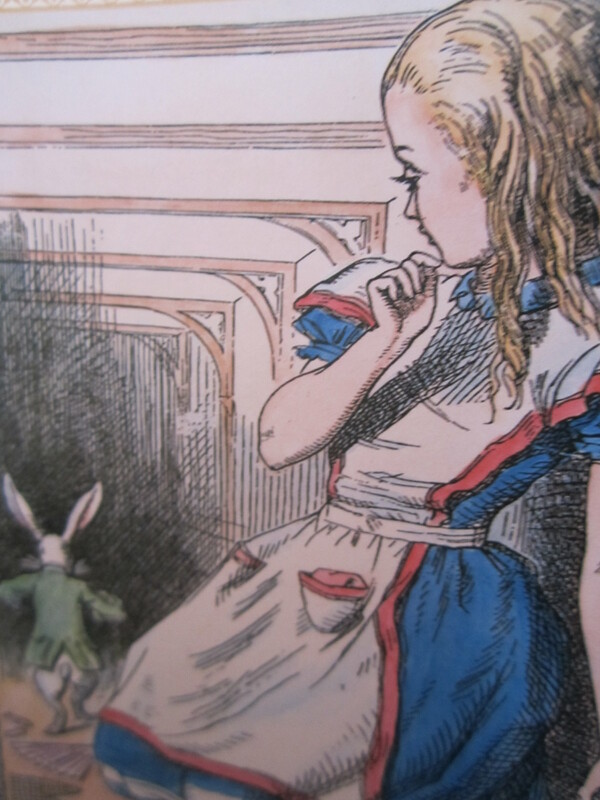 ”Burning with curiosity, she ran across the field” after the Rabbit in the waistcoat with pocket-watch (p 20); and thus, when she crosses into Wonderland, Alice grows up, physically that is, but remains a child within. And when she is in this strange world, she chases material objects and finds that the world is easier in some ways and more difficult in others. ”’Things flow about so here!” she said at last in a plaintive tone, after she had spent a minute or so in vainly pursuing a large bright thing…” (p 178). We find her once again referring to ”bright things” but only after she has learned her lesson: ”How she would keep, through all her riper years, the simple and loving heart of her childhood…and make their eyes bright and eager with many a strange tale” (p 118). What did she learn? Alice found that although she must mature and leave her childhood, physically, that she can choose to never lose the child-ego within and to remain innocent and not heed to the cruelties of the adult world that is represented in the Red Queen; but after, Lewis Carroll writes, what does life really mean, whether as child or adult, and so he finishes the two tales by asking: ”Life, what is it but a dream?” (p 239). Indeed. And Alice shall live on forever. But, I must ask, why is a raven like a writing desk? Carroll, Lewis. (1865, 1871) Alice’s Adventures in Wonderland & Through the Looking-Glass. New York: Signet Classic, 2000. Print. post upper! Come on over and seek advice from my site .